This magnificent basket makes a giant impression. 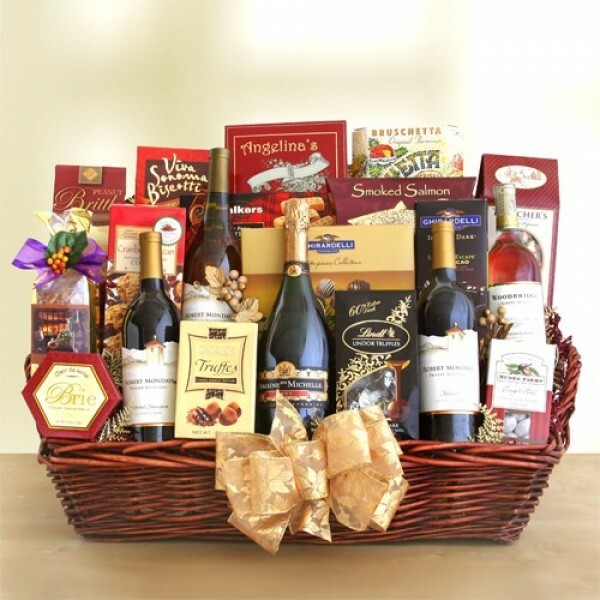 Four outstanding bottles of fine California wine, a chardonnay, a cabernet sauvignon, a sauvignon blanc and a merlot, as well as a delightful California sparkling wine are featured in this sumptuous gift. Also included in this unbelievable array of sweet and savory treats: peanut brittle, Ghirardelli Masterpiece chocolate collection, Godiva truffles, chocolate toffee almonds, Brie cheese, gourmet popcorn, bruschetta crisps, sweet butter cookies, Walker's shortbread cookies, biscotti, cranberry pecan cookies, savory snack mix, Jacquot truffles, a Ghirardelli Intense chocolate bar and smoked salmon. When only extravagance and style will do!